The sixth and latest volume of episodes from R.L. 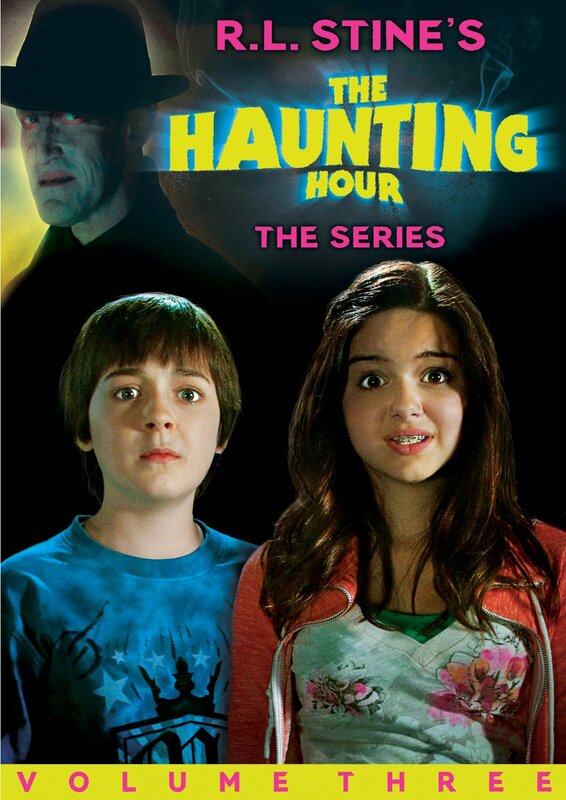 Stine’s hugely popular series, The Haunting Hour offers four more frightful tales of terror for viewers off all ages. And it’s not the end for fans of the hit series, either. Volume Six brings home even more episodes from the series’ second season just in time for the start of the series’ fourth season. Volume Six is another fright-filled joy for viewers not only because it continues the tradition of offering wonderfully fright-filled stories, but also because it carries on the traditions established throughout the series’ previous volumes. From the disclaimer encouraging parents to be parents and watch the show with their kids to including young well-known guest stars, it’s all here once more, making Volume Six one more must have for any kid and kid at heart. The Haunting Hour Volume Six brings to viewers four more episodes from the series’ second season. And just as with Volume Five, the first of those episodes is split into two parts. The episode in question, titled “Creature Feature” is also one of the best from this set. This episode sees a young classic film buff named John (Joel Courtney—Super 8) discovering that sometimes it isn’t just a movie. He discovers this after being accidentally pulled into one of his favorite classic B-flicks at a haunted drive-in. The twist comes when he escapes the movie. It turns out that the movie was much more real than he or even his friends could have imagined. In another of the season’s best episodes, the show’s writers pay homage in their own way to Rod Serling’s classic series, The Twilight Zone in “Brush With Madness.” This episode sees teen comic book aficionado Corey (Dylan Minnette–Awake) getting to meet his favorite comic book artist, Allan Miller (Mackenzie Gray) at a comic book convention. After being blown off by Miller, Corey takes Miller’s brushes, which leads to an ever more tense fight to stay alive. These two stories are just a couple of examples of the scary fun offered up by R.L. Stine in Volume Six of The Haunting Hour. There is much more in the remaining episodes that audiences will enjoy. And it’s not the only reason that parents and kids alike will enjoy this latest release. Volume Six is just as impressive as the series’ previous releases because it continues the traditions established in said compilations. One of those traditions is the inclusion of a straight forward disclaimer before each episode. The disclaimer states in no uncertain terms that the show may not be suitable for children under the age of seven, and that young viewers should only watch the show with their parents. This is a polite yet straightforward way of telling parents that they need to step up and be parents, rather than just leave their kids to watch anything. They need to take an active role in their children’s lives and make their own decision on what they think their children should watch. This is a standard established from early on by The Hub network. And it is good to see that those behind the show have continued it six volumes in. The inclusion of a polite yet straightforward disclaimer at the start of each episode is an important part of the whole presentation. It’s not the only important part of the whole. Also continued in Volume Six is the tradition of bringing in famous young celebrities in select episodes. This time out, Super 8 stars Joel Courtney and Riley Griffiths guest star in two of the compilation’s best episodes. Also on board this time out are Julia Benson (SGU: Stargate Universe) and Dylan Minnette (Awake). While some younger viewers may not recognize all of these names, parents are more apt to know who they are, thus helping to encourage parents to take an active role in their kids’ lives and watch the show with them. Along with the disclaimer before each episode, it’s one more ingenious way to get parents to get involved in what their kids are watching. For that, those responsible for bringing the guest stars for these episodes are to be commended. Those behind the show as a whole are to be commended. Not just for these brilliant methods, but for crafting four more episodes full of fright-filled for the entire family. Volume Six is available now in stores and online and can be ordered direct from the Shout! Factory store at http://www.shoutfactory.com/node/217799. More information on this and other shows from Shout! Factory and The Hub Network is available online at http://www.shoutfactory.com, http://www.facebook.com/shoutfactoryofficial and http://www.hubworld.com. To keep up with the latest sports and entertainment reviews and news, go online to http://www.facebook.com/philspicks and “Like” it. Fans can always keep up with the latest sports and entertainment reviews and news in the Phil’s Picks blog at https://philspicks.wordpress.com. The fifth volume in author R.L. Stine’s spine tingling series, The Haunting Hour is another spine tingling compilation that is just as much scary fun for kids as it is for adults. Right from the outset of each episode, parents will be smiling thanks to a small but important addition. That addition is a disclaimer about just how scary each episode can potentially be depending on a viewer’s age. From there, kids and parents will enjoy watching all four episodes included in this compilation (one of the episodes is split into two parts) because of how scary they are. As an added bonus, parents will appreciate the episodes because of the lessons that are taught in such subtle fashion. All said and done, The Haunting Hour Volume Five is one more wonderful and wonderfully scary addition to any young horror fan’s collection. Ever since its inception years ago, the ratings system used for television shows has come under a lot of fire. It has come under fire because of its inconsistencies and ambiguous nature. So the inclusion of a disclaimer at the beginning of each episode is an important addition to the compilation. The disclaimer spells out in no uncertain terms that some of the included episodes may be too scary for some younger viewers. And rather than just using the standard “parents discretion is advised” line, the people behind the show took another road in telling parents and children that they should watch the show together. Believe it or not, this is HUGE. It’s saying without saying that parents need to be more involved with their children and be parents. It’s saying that parents need to see what their kids are watching so that they can make a responsible decision on what they think their children should or shouldn’t watch. All parties involved in making this happen are to be highly commended for this subtle yet at the same time blatant statement. Having been told that they should watch the show with their children, parents and children will both appreciate the scares and chills offered in each episode. Even parents will have to admit that even in Volume Five, there are some scary stories, starting with the two-part episode, “Scary Mary.” This episode sees young Hanna (Eva Allen) and her friends learning the dangers of peer pressure. It all starts when she and her friends decide to play what they think is a harmless paranormal based game called “Scary Mary.” It just so happens that the game is just like a certain paranormal game that some people try to play in real life, which is just as dangerous and should not be attempted. It also plays on a very real belief about the paranormal linked to mirrors and spirits. Anyone with any understanding of the paranormal will appreciate that inclusion. The set’s second episode, “Swarmin’ Norman” teaches another valuable lesson to young viewers. It teaches the lesson that revenge is a dish best served cold. On top of that it teaches about the dangers of getting power hungry. It offers both through the story of a young boy named Norman (Bobby Coleman) who learns that he can control insects after being bullied one time too many. He had great power. But he didn’t use it responsibly. The result was quite deadly to say the least. 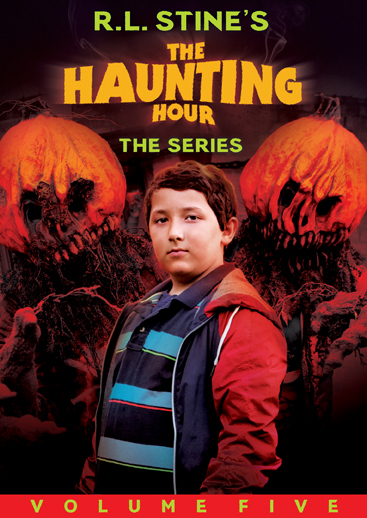 These episodes are just a couple of examples of why parents will love to use The Haunting Hour Volume Five this Halloween for their children’s Halloween parties. Of course, there is still another reason that this set is such a scary joy. That reason is the guest spots. 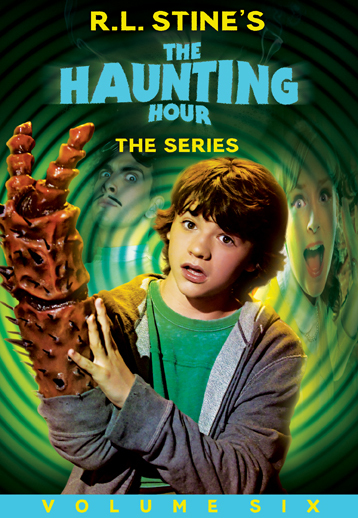 The people behind The Haunting Hour have made a tradition of including young well-known guest stars to help drive the show’s popularity. The episodes culled for Volume Five are no different. This time out, Frankie Jonas (Jonas L.A.), Liam James (The Killing), Dakota Goyo (Real Steel), and Jean-Luc Bilodeau (Kyle XY) make appearances. Goyo stars as a young boy named Josh on a flight sharing a seat with a ghost that only he can see. The problem is that the ghost in question is trying to get away from the Grim Reaper, who is also on board the flight. Liam James and Frankie Jonas share the screen in the set’s closing episode, “Pumpkinhead.” And Jean-Luc Biloddeau guests in the set’s opening episode. This continued inclusion of younger stars will definitely help to bring in younger viewers. And together with the aforementioned factors, the total presentation that is The Haunting Hour Volume Five turns out to be another welcome addition to any young horror lover’s home collection. It is available now in stores and online. It can be ordered direct online from Shout! Factory’s online store at http://www.shoutfactory.com/node/217796. More information on this and other releases from Shout! Factory and Hub Network is available online at http:/www.shoutfactory.com, http://www.facebook.com/shoutfactoryofficial, and http://www.hubworld.com. To keep up with the latest sports and entertainment reviews and news, go online to http://www.facebook.com/philspicks and “Like” it. Fans can always keep up with the latest sports and entertainment reviews and news in the Phil’s Picks blog at https://philspicks.wordpress.com. Warner Brothers has largely started off 2013 in successful fashion. Its only major missteps so far this year have been its DVD and Blu-ray release of Hats Off to Dr. Seuss and Tiny Toon Adventures Volume 4. Save for those two problematic releases, Warner Home Video has largely seen more success through the first two quarters of the year. Now Warner Home Video has started off its new quarter by catching its footing in the first half of Taz-Mania Season One. Taz-Mania Season One Volume One is one of many candidates for the best children’s DVDs and Blu-rays of 2013. That’s because unlike the company’s previous missteps, this release gets almost everything right. The only downside to this set is something that has plagued many of its releases so far this year. And that will be discussed later. 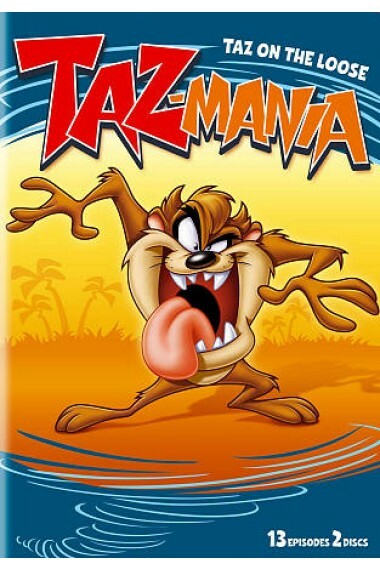 Taz-Mania Season One Volume One is a welcome release from Warner Home Video. This relic of a bygone era is one more example of everything that made not only children’s programming great, but also television in general. As audiences will see in Season 1.0, Taz-Mania made both children’s programming and television in general so great because unlike the cartoons that pollute television’s channel lineups today, it’s a cartoon that even today families can watch together. That’s thanks first and foremost to the show’s writing. The show’s writing is witty and clever. It’s taut enough that adults won’t feel like they’re being dumbed down. At the same time, it offers just enough comedy for even today’s younger viewers to find themselves laughing. The constant fights between Taz and Molly are something to which both adults and kids alike can relate, and thus at which adults and kids alike can laugh. And Taz’s constant adventures with his fellow characters are just as enjoyable. Viewers of every age will love watching Taz go diving for undersea treasure with Digeri Dingo, facing off against Francis X. Bushlad, and even taking on a part-time job in hopes of getting his own motorcycle. There’s even a heartfelt story telling how Taz first got his pet, Dog the turtle. If it doesn’t pull at a viewer’s heartstrings, nothing will. There is so much more that audiences will enjoy from this first half of Season One. This is just a taste of what kids and kids at heart can expect from this set. The witty, clever writing of Taz-Mania makes it a great addition to any Looney Tunes fan’s library regardless of whether one is seeing it for the first time or for the first time again. It’s just one part of the show’s success. The animation style is another plus to this modern classic cartoon. So many of today’s “cartoons” are cartoons in the loosest sense possible; those that are at all. For the most part, most of today’s kids programming is dominated by CGI created shows and live action fodder for tweens and teens. Those rare hand-drawn cartoons that are left have been spit-shined. Taz-Mania is the exact opposite. Its more “rough” animation style is a throwback to the classic days of animation. It doesn’t have the finely defined borders and background designs of so many of today’s cartoons. It really serves to help Taz-Mania develop its own identity, even among other cartoons from its era. In its own right, one could even argue that Taz-Mania’s animation style is a direct throwback to the golden era of Looney Tunes. That makes this double-disc set even more worth watching regardless of one’s age. The writing and animation in the first half of Taz-Mania’s debut season are both big factors in the show’s success. There is at least one more factor to consider in determining whether Warner Home Video’s people have succeeded with this latest release. That factor is the double-disc set’s packaging. The packaging is by and large, a success. It follows the same formula that has become the norm for multi-disc box sets. Both of the set’s discs are placed on their own spot inside the standard size DVD case. As with any other set packaged in this fashion, it protects the discs from scratching and in turn, increases their longevity. The discs themselves are the only real downside to the entire set. Anyone that has picked up any previously released sets from WHV this year will notice that the people at WHV have not put a whole lot of thought into appeal on the discs. Sure, there are designs on both discs. But both discs are splashed in a single, flat tone. It would have been nice to see a full color design rather than something that looks like someone took a paint brush and ran it right over a bunch of clear designs. This is a minor issue. But it still plays a part in the overall picture. This might be as simple as a cost-cutting measure. If so, it’s understandable. Otherwise, this is something that the people at WHV will hopefully fix with any of its upcoming release. The double-disc set is available now in stores and online. It can be ordered direct online from the WB shop at http://www.wbshop.com/product/tazmania+taz+on+the+loose+season+1+part+1+1000303587.do?sortby=bestSellers&from=Search. R.L. Stine and The Hub are back with two more volumes of seriously scary stories for kids and their parents. The Haunting Hour Vol. 3 & 4 offer audiences ten more tales of terror that will entertain and scare audiences every time they turn them on. This latest pair of volumes offers not only five great episodes each, but some star power, too. The Haunting Hour Vol. 3 boats guest appearances from the likes of Robert Capron (Diary of a Wimpy Kid), Maddison Pettis (Cory in the House), Christopher Heyerdahl (Hell on Wheels, Sanctuary), and others. Apparently, Heyerdahl has a thing for playing villains, much like Tim Curry, as he takes on the role of quite the scary character in the episode, ‘Fear Never Knocks.’ Heyerdahl’s character is absolutely creepy in his role in this episode, terrorizing a pair of children who stumble upon their grandfather’s “box of fear.” He is released when young Jenny decides to play with the box, and releases both her fears and those of her brother and fear itself (played by Heyerdahl). Also in Volume Three, Maddison Pettis is one of three kids that get caught up in a supernatural story that brings the past and present together thanks to a mysterious mask. The mask shows events that happened in the past, which themselves lead to another mystery that will leave viewers guessing right up to the end of the story. And in another of the set’s best episodes, Robert Capron plays a young man whose overactive apetite leads him to get much more than he hoped for after a strange ice cream truck starts making rounds through the boy’s neighborhood. This is an episode that will send “chills” (ba-dump-bump-bump) through every viewer, and will make them think twice next time they see an ice cream truck come through their neighborhood. What’s more, it’s a valuable warning against over eating, too, ironically enough. It’s little things like this, and the writing for the other noted episodes that make The Haunting Hour Volume Three another nice inclusion for any fan of ghost stories and of R.L. Stine’s work. The scares don’t stop with Volume Three of The Haunting Hour. Fans will also enjoy Volume Four, which was released alongside Volume Three. The show’s fourth volume offers even more scares, as well as guest appearances. It all opens with another episode that’s just as much a warning as it is a scary story in ‘Wrong Number.’ Debby Ryan (The Suite Life on Deck, Radio Rebel) stars in this episode as Steffani. Steffani is a rather spoiled young woman that is the very stereotype of the stuck up “mean girl.” But she gets what’s coming to her when she and her friend decide to prank call an elderly woman one night. The consequences of her actions turn out to be deadly, as a matter of fact. This is just one of the many scary stories presented in The Haunting Hour Volume Four. Another equally terrifying tale included in this set is the episode, ‘Lights Out.’ Super 8 star Gabriel Basso stars as Teddy, a young teen skeptic who is pulled into a ghost hunt after watching a ghost hunt show on TV. Teddy’s friends set out to prove to him that ghosts are in fact real in their hunt for the supernatural. He learns that lesson in a way he never would have expected, nor will viewers who have never seen this episode. The twist ending will scare audiences to no end and leave them talking. As with Volume Three, what is presented here is just part of what makes Volume Four so enthralling. The stories presented in these two volumes are sure to scare and entertain both kids and adults alike. The Haunting Hour recently wrapped its third season on The Hub network. Allegedly, a fourth season might be in production. That gives ample time for both seasons Two and Three to be released to DVD while fans await the show’s return to The Hub. Until then though, these last two volumes of Season One will keep audiences coming back again and again. All four volumes are available in stores and online and can be ordered online direct at http://www.shoutfactorystore.com. Halloween is one of the favorite days of the year for parents and kids alike. Lots of people like to go out trick-or-treating. And then there are those who choose to celebrate the big night in the comfort and safety of their homes with parties. That’s just as enjoyable. And planning those parties can be almost as stressful as getting ready to go out. That’s especially the case when planning parties for kids. So the question is raised what to do to keep kids entertained at those celebrations? How about another DVD with nearly an hour and a half worth of spooky tales courtesy of children’s horror master R.L. Stine? 20th Century Fox and Scholastic have re-issued another pair of the classic Fox Kids’ show in a dual set loaded with even more scary family fun. In the classic collection, “Go Eat Worms”, audiences are introduced to a young man whose fascination with worms leads to some very bad consequences for him. In what is one of the best of this set, a brother and sister discover that the legends of lawn gnomes might be true after all, and then some. And when a young man’s fascination with magic leads him to his favorite magician’s show with his kid sister, things turn bad real fast. The title episode of the set, “Go Eat Worms” introduces young Todd. Todd has quite the fascination with worms. But that fascination gets a little more than scary after he conducts experiments on them and even goes so far as to use them to play a trick on his sister, Regina. After this, worms suddenly star appearing all around him. They’re even in his bed. When Todd confronts his sister the next day after the worms’ sudden appearance, she denies any involvement. Later that night, Todd goes out in search of more worms for his science fair exhibit when he falls down a hole in the forest. Todd discovers in falling down the hole, that he’s surrounded by worms. He even comes face to “face” with a giant worm that nearly strangles Todd to death until Regina inadvertently saves him. How does she save him? Viewers will have to find that out for themselves. After that incident, Todd seems to have learned his lesson and leaves worms alone. But as viewers learn at the end of this episode, he apparently hasn’t learned his lesson quite yet. Viewers will have to find out for themselves what that means. “Go Eat Worms” is loads of spooky fun. It’s just one part of what makes this new set from 20th Century Fox and Scholastic so much fun to this day. The second episode from this new re-issued set, “Revenge of the Lawn Gnomes” is one of the set’s absolute best episodes. Viewers meet brother and sister duo Joe and Mindy in this episode. Joe and Mindy’s neighbor, McCall is a retired military vet who obviously hasn’t lost his training. He’s also quite the bully. When Joe and Mindy’s dad comes home one day with a pair of lawn gnomes, MCCall instantly comes over to make fun of them. But as audiences will soon discover, the gnomes don’t exactly appreciate being made fun of. The problem is that Joe ends up taking the blame for the gnomes’ destruction to McCall’s yard. So Joe decides to prove it wasn’t him. He grabs a video recorder and tapes the gnomes and follows them. But when they discover Joe and Mindy, the gnomes chase them and steal the camera. Luckily though, Joe and Mindy are able to lure the gnomes into a trap to defeat them. At the same time, the trap also inadvertently deals with the issue of McCall. How so? Once again, audiences will have to find out for themselves when they pick up this newly re-issued dual disc set from 20th Century Fox and Scholastic. If gnomes and worms aren’t scary and spooky enough for audiences, how about an evil magician bent on creating some of the scariest and most evil tricks ever dreamed up? In “Bad Hare Day”, young hopeful magician Tim wants to be a great magician. So one night, he sneaks out to see The Great Amazo at the Midnight Mansion. Just as he’s about the sneak out though, Tim’s bratty little sister Jenny almost keeps him from going when she catches him. She threatens to tell the pair’s parents. So he agrees to take her with him. At first Tim’s having a great time. But when he’s selected to volunteer for a trip, things turn bad when he gets trapped behind stage. He searches around and finds Amazo’s dressing room. He hears a voice that he thinks is that of Amazo yelling at him. So he takes Amazo’s bag. When he opens it the next day, he pulls out a rabbit who turns out to be a magician named El Sydney who had been trapped in the body of a rabbit. This is when things start to go south. He convinces Tim to release him from the rabbit’s body. Tim does. But the end result isn’t too happy for Tim. Once more, audiences will have to find out for themselves what happens. 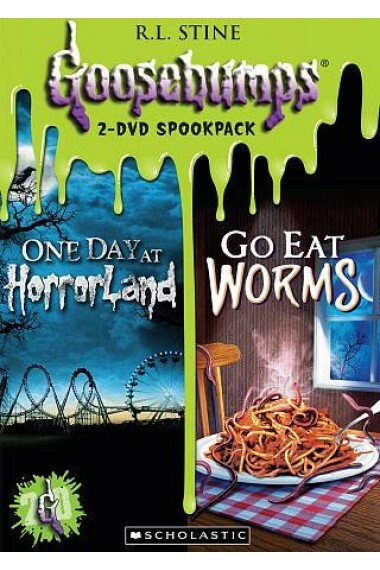 “Goosebumps: Go Eat Worms/One Night in Horrorland” is available now on DVD. Halloween is getting closer each day boys and ghouls. That means all the parents out there are likely looking for ways to entertain all the little ghouls and ghosts at all those Halloween parties. What better way than with another spooky set of stories that parents and kids alike will enjoy. And who better than children’s horror master R.L. Stine to deliver them? 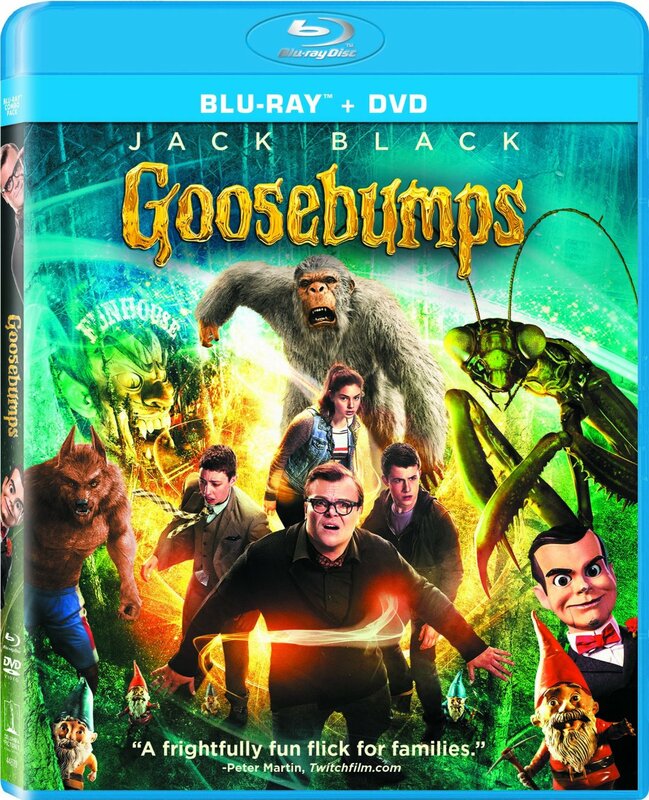 Thanks to 20th Century Fox, fans of Stine’s classic Fox Kids show, Goosebumps, will have plenty of scares to go around in some newly re-issued compilations. One of those compilations is a set combining the collections of “Ghost Beach” and “The Headless Ghost.” All six episodes from these two compilations are here in this new set. Among the best of the set are the lead stories from “Ghost Beach” and “The Headless Ghost”, as well as a spooky little story about a pair of 17th century crooks turned into dogs. The “Ghost Beach” compilation opens with the title feature. In this episode, audiences are introduced to brother and sister Jerry and Terri. They’re exploring a graveyard at a beach when another pair of siblings named Sam and Louisa give them a little scare when they suddenly appear. After introducing themselves, they tell Jerry and Terri about a haunted cave at the beach. In learning about this legend, Jerry sets out the next night to find the cave. Sam and Louisa just happen to be there. They tell jerry and Terri that the ghost who haunts the cave is that of Harrison Sadler. At first, Jerry and Terri don’t believe Sam. Despite being told to stay away from the cave, Jerry and Terri go anyway the following night. When they discover isn’t a ghost, but the descendant of Harrison Sadler. He reveals that it’s not him but Sam and Louisa who are the ghosts. He tells Jerry and Terri to go back to the graveyard for proof that he’s being honest. They find Sam and Louisa’s graves. But when Sam and Louisa appear, things get even stranger. It turns out that Sam and Louisa are the real ghosts, just as Harrison Sadler had said. Things aren’t entirely finished even after this final confrontation, either. What happens next is left for viewers to see for themselves. Not scared yet? The scares keep coming in the episode, “The Barking Ghost.” Here we are introduced to a young man by the name of Cooper. Cooper and his family are getting ready for bed in their new home as we are introduced to him. Cooper’s brother Micky picks on him for investigating the seemingly phantom barking that he hears in the forest behind the family’s home. Cooper heads off to investigate the sounds anyway. What he finds isn’t so nice. Along the way, he meets a new friend named Fergie who investigates the sounds with Cooper. As they’re investigating the sounds, the “ghost” dogs intercept the pair and lead them to a tree not far from the house and push them in. The dogs reveal that they’re really the spirits of the two crooks caught hundreds of years ago and they were going to switch bodies with Cooper and Fergie. That switch-up doesn’t last long for the crooks though, as they learn that even in death, crime doesn’t pay. Along the way, Cooper’s brother gets a little switch-up of his own that will leave audiences laughing. Audiences will have to watch this episode themselves to find out just what happens. Things turn out for Cooper and Fergie at the end of ‘The Barking Ghost.” But things almost don’t turn out so well for young Stephanie and Duane when Stephanie drags Duane along for a little after hours ghost hunt in the haunted Hill House in “The Headless Ghost.” Who hasn’t taken a haunted tour before? There are so many haunted locations across this country. One of them is the famed Hill House. The story of the Hill House is centered on a young boy named Andrew who was looking for a ghost when he lost his head, literally, after the ghost revealed itself to him. Almost two centuries after this legend happened, the Hill House tour director said that Andrew’s ghost still haunts the house, looking for his head. As he is telling his tour group of the legend, Stephanie grabs the leg of a young girl, scaring her and greatly upsetting the tour guide, who throws her out. Stephanie decides to go looking for Andrew’s ghost and drags Duane along. Again, they’re discovered by the tour guide and thrown out. This is when the pair meets “Seth.” “Seth” takes Stephanie and Duane on an after-hours ghost hunt that almost has deadly consequences for Stephanie when it turns out that Seth isn’t exactly who he says he is. What happens to her? Viewers will once again just have to find out for themselves when they pick up this re-issued combo pack for themselves. 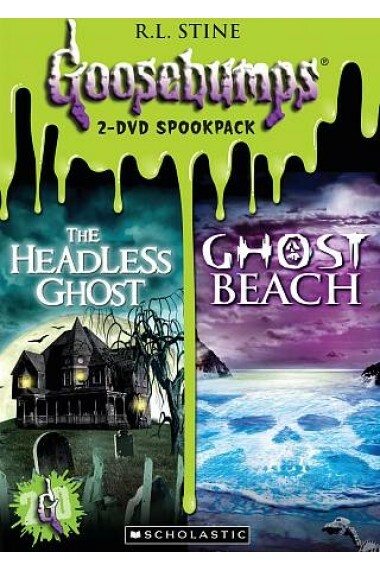 The new Goosebumps “Ghost Beach/The Headless Ghost” dual set is available now on DVD courtesy of 20th Century Fox.